CAT 2018 Changes (expected) have been given in this article. 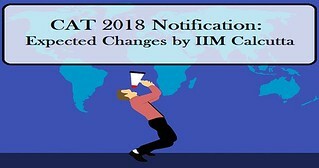 IIM Calcutta has released the CAT notification on 29 July on the official website of Common Admission Test. The registration will begin on 8 August. The CAT Exam brochure will be released soon. This year there may be some changes in CAT Exam and we have listed those changes in the article. With the availability of CAT 2018 notification, we can expect various changes in the test pattern and in the conduct of the test. CAT Dates for registration, the exam has been released. The CAT brochure will show the CAT changes that may be introduced this year. IIM Calcutta announced the CAT exam date much earlier than the expected date. CAT 2018 is a computer-based test and will be held across various test centres on 25 November 2018. With the availability of the exam date much earlier, candidates can expect the CAT mock test to be available before the expected date. Every year, CAT exam is becoming more friendly for the candidates who are from the non-engineering background. This year, it is expected that there will be a slight increase number of non-MCQs in CAT 2018. Check the list of expected CAT dates 2018 from the table below. Note: The dates provided on the table above are prepared on the basis of previous year CAT schedule. These dates will be updated with the announcement of the notification.